Ivan Gomez sauntered into the lobby of the once-again luxurious Hotel Nacional in Havana. He was tall and large as a linebacker, brimming full of nervous energy. He greeted us warmly. On the suggestion of a friend back home, Ivan Gomez became our informal guide for three days in Havana. We two American guys followed him around like eager puppy dogs looking for adventure. Walking along the city streets, Ivan knew someone on each lively, decaying block, greeted them with handshakes, abrazos, kisses on the cheek. We met amigos, friends of his girlfriend, aunts, uncles, primos, former in-laws, compadres and patrons of the club where he worked as a bouncer and as a teacher of salsa dancing. When we needed food, he found good places to eat, sometimes cheap, sometimes costly, but never boring. When thirsty, he introduced us to sugar cane juice, freshly ground from stalks at a walk-up stand, served up in ice-filled goblets made from broken rum bottles, the sharp edges smoothed. When my companion, John required medical care for a healing finger wound, Ivan led us to a giant hospital. Because John had twenty-five dollars he could pay to the special clinic for foreigners, Ivan arranged for a specialist to care for him ahead of the waiting room filled with local patients. He showed us the old Cuban state-run stores that accepted only Cuban pesos but had very little for sale and many empty shelves. Then he took us to the newer ‘dollar’ stores bulging with clothes, cosmetics and consumer electronics but that accepted only American dollars or Euros—out of reach for most Cubans. He took us dancing at night to the local Casa de Trova, housed in a narrow open hall tucked inside a once-elegant courtyard, filled with wooden benches where a lively band played Cuban son without need or benefit of a sound system. A much-older woman winked at me as an invitation to dance; and I jumped to her side as Ivan stood watching, laughing and cheering my exuberance, rather than my dancing skill. He introduced us to strong Cuban coffee, fragrant cigars and beautiful women. We partook only of the coffee and one cigar. We paid him a pittance, really, though he asked for nothing and became quite humbled when I pressed cash into his hands. He asked why I did not take up an offer to spend time with the legendary women of his city, and I told him that being married, I was determined to remain faithful to my wife at home. As we strolled back along the broad Maleçon seawall, the beautifully jagged Havana skyline spreading before us like broken teeth, Ivan pointed out a tall building with the windows oddly stacked and cantilevered floor by floor. Ivan, like most Cubans that I met, never seemed in the depths of poverty that I had seen among people on parts of other islands of the Caribbean or in Mexico. But there was a nervous desperation in his life, behind his kind humbleness, a frantic search for monetary success before his time on earth played out. It was not in line with the official Cuban socialist spirit, but to us as Americans it seemed normal. 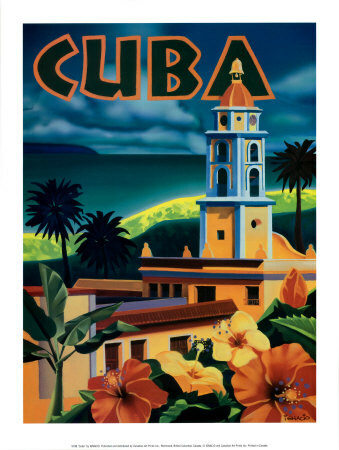 John and I saw it among many of Ivan’s generation in Cuba, where everyone appeared to be well fed, well educated and have access to medical care. It was just that most jobs, from professor, engineer or janitor paid perhaps ten to thirty dollars a month. And there seemed no way within the system to make more. And so, tourists to Cuba, as in many other countries, are besieged by locals looking to befriend them and offer their services in exchange for dollars. Finally, one evening we sat alone and far away from others in the back garden of Hotel Nacional. Over a couple of rums añejo, (aged) a story poured out from Ivan’s heart, a tale of love, heartbreak and frustration, a tale of contemporary Cuba. He said, “I have a son in Cojimar, a village by the sea just outside Havana where the great writer Ernest Hemingway used to keep his famous fishing boat. My son lives there with his mother, Alicia. He is six years old, and he’s the light of my life. But Alicia and I do not live together. She is a little crazy…you know? But I was crazy when I went with her, crazy because at that time I was married to another woman. And it was very bad between my wife and me. Yes, that was truly crazy. “It didn’t start like that. Before my wife and I met in 1991, times had been good. The eighties in Cuba were fantastic. There was work; there was money. My parents were always in favor of Fidel and the Revolucion. My mother and father are both Communists and very proud of what the Revolucion did to help the people of Cuba with the help from our Soviet benefactors. They named me in honor of a Russian who they became friends with here. As you see, many Cubans my age have a Russian name, like Yuri, Dmitri, Vladimir or Natasha por una chica. My father was a bus driver and did okay. Today my father and mother cannot understand why I am so unhappy. “I was always a big boy.” He laughed. “I became a rower on a team, rowing in the harbor here and in the sea; we were champions in Cuba. I also started in business when I was young, sixteen, selling mangos and rum on the beaches to tourists. “Then came the war in Angola, and I went. I felt it was my duty, an honor to sacrifice something for my country and for the Revolucion. But after I got there I saw that something was not right. There was a lot of dirty business. All sides were doing terrible things and it confused a lot of us. Maybe all war is like that. But I tried to stay to the side, away from the real fighting, fixing trucks and vehicles. I saw many Cubans badly wounded and not taken care of properly, and sent to die for something not right. They paid us thirty dollars a month. Other soldiers from the Soviet countries and mercenaries were getting three hundred dollars to do the same as us. “When the Soviet Union collapsed in 1989, they pulled out of Cuba; and life got really hard. There was no work and no money. “It was in December 4, 1991 that I met Danielle, my wife, at a wedding of a friend. She was seventeen, a lovely ballerina; and her hair spiraled out when she danced. I thought she was easily the best-looking girl at the fiesta. I was then twenty-four. I saw her looking at me, and I asked her to dance when they began playing salsa. She said that she did not like salsa music, but I got her to dance with me anyway. I could see that she was a real dancer, and she moved differently than most women because of her training. “I began asking her out. At the time I was in college. Because of my background on the rowing team, and my love of sports I studied hard to be a physical education and sports instructor. I finished two years, but then things got so tough for the country and my family that there was not enough money to finish my last year of education. I had to drop out and go to work to help support us all. “Danielle’s family was very poor, worse than mine. Her father worked for the Civil Militair and made very little money. Danielle and her mother did not work, and they had two grandparents and other elders living with them who needed care. Still, Danielle and I were very much in love and in 1993 we married. “With the inflation that happened in Cuba after the collapse of the Soviet Union, our Cuban pesos kept dropping in value. First it was two pesos for a dollar, then four, then six. In 1994, the peso dropped to twenty-six to the dollar. But prices did not drop; they went up. “People started rioting. Many tried to leave from Cuba. We called them balseros because of the flimsy boats they made of balsa wood. I had offers to go on some, especially because people knew of my ability to row at sea; and let me tell you, I was tempted. But I knew it was very dangerous, and I could never leave Danielle. So I stayed behind trying to hunt up any work I could find. “In Cuba, you know, we do not own hardly anything. Maybe a car. Or we have the right to use a house if we pay; but a business or some way to make more money, no. A very few can get permits for renting rooms to foreigners or driving foreigners in taxis; but for the most part, everything is owned by the government. And so we all work for the government, and get paid by the government in pesos. “Like I said, when the Russians helped us, times were good. When they left and the peso dropped, you got paid maybe what would be worth in dollars seven to twelve dollars a month. And as you have seen for yourself in Havana, it is only in dollar stores, not places that take pesos where you can buy anything good. “I went back to selling black market, rum and mangos on the beaches to tourists. Sometimes Danielle came with me to help, and because she was so beautiful, I could see that many of the foreigners wanted her. Foreign men offered me money for her; but of course, I refused. They offered me thirty, forty, fifty, sometimes a hundred dollars for her. Do you know what a hundred dollars could buy in Cuba then? “You know how many friends I had who let their women go with foreigners so that they could make a few dollars to spend in the dollar stores? But we didn’t do that. “Danielle’s family didn’t like me, though. Not because I wasn’t nice to her or to them, but because I was a young Cuban with no future. Danielle had an uncle, a trumpet player who got to tour through Europe. One day this uncle invited her over to his apartment. A friend of the uncle’s, a musician from Italy had come to visit. He was very taken with Danielle even though he was almost sixty years old. “Danielle’s family told her that she should go out with him while he was here, show him a good time. Then they began to say bad things about me and put bad thoughts into her head. They told her that I was not being faithful to her because I was out many nights at bars and discos trying to work as a dancer and as a dance teacher. But I never went with another woman at that time. “Still Danielle’s family kept it up, telling her how I would never make the money that the Italian made, and lying to her, saying that I was cheating on her. So she went out with him; and the Italian bought her family new clothes, furniture, a TV. He left to go back to Italy, but promised to return to Cuba for her in six months. “That’s all I heard about from her mother and father, ‘just wait until the Italian comes back. She’s waiting for him, not for you.’ How could I compete with someone else with money? Even if he was much older, that didn’t matter. “I started to go crazy then. I started to go out with other women, and I didn’t always pick the best ones. The one I told you about, yes she was a little crazy and I got her pregnant. In six months the Italian returned and Danielle went with him. I called her terrible names, ‘puta’ and worse. We had a terrible fight and she scratched me all up. Then we got a divorce. “She married the Italian, and they still live here today. For money, that’s all, just for the money. You know what? That’s what happens in Cuba. I have other friends who this happened to. They had girlfriends or wives, but no money and no chance to earn anything here. So they try to leave, or they let their women go with men to earn something. Or, like me, they slowly go crazy or do anything possible to escape this place. “My son is six years old now, and he is the light of my life. I give my whole month’s salary, one hundred sixty-eight pesos, about seven American dollars to his mother to care for him. She is married to another man, but they live very poorly, just outside of Havana. I go try to visit my son every week. I can’t bring him to Havana because he sees all the wonderful toys and clothes and electronic games in the dollar stores and wonders why his father can’t buy them for him. “And now for the past two years I have another girlfriend, Rosita. You’ve met her. She’s beautiful, and very intelligent, twenty-two years old. Now I’m thirty-six, and I know that I’m not getting any younger. I could love her very much, and I don’t cheat on her. Never. “But her mother doesn’t want her to go with me, and makes it difficult for us because still I have no future here. The mother has a sister in Spain, and they are getting their documents together to immigrate there. Rosita tells me that I should try to go to Spain, too. I would go, but I have no one in Spain, no family, no relatives. And it’s too far to row. I understood what it meant, that love loses out to money, or security, or self-interest, whatever you want to call it, if it comes down to a choice. I didn’t know what to say to Ivan. I told him that we in America had everything that the young Cubans wanted, all the things one could wish to buy, more than they could ever imagine. But we did not have the things that I found in Cuba that one could not buy with dollars or any other currency. I thought about my two weeks in Cuba, and the way I saw music and art and laughter flowing easily from the people in and out of buildings, through the streets up to the sky and down to the sea. I thought of the countless ways that I saw the people always conniving to make things work with so little, yet always patiently trying to enjoy the lives they led while they knew that all the temptations they ever dreamed of lay a dangerous hard day’s row away. I wanted to tell him that, even with the all the things Cuba lacked, they had accomplished so much to be proud of with so little. I thought to say that things would probably get much better if we could finally end America’s boycott. But I doubted it would help. And so I said to Ivan that we Americans were always so busy in working and acquiring that we had no real skill in savoring the things that we had. I told him that if we were to switch places, I doubt he would really still be happy in the long run. I told the truth, but given the chance, I knew I would not switch places.